Years ago, the husband-and-wife team of John Tooby and Leda Cosmides argued that culture arises from our innate psychological make-up (Tooby & Cosmides, 1992). 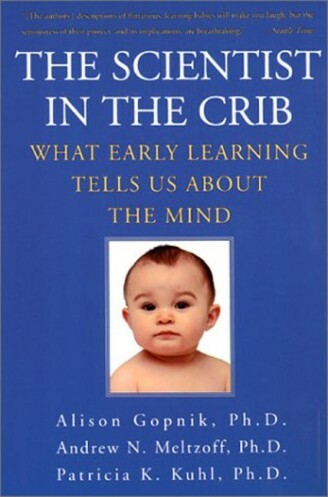 The authors of The Scientist in the Crib seem to take a different view, holding that our phycologies arise from the external culture we are built to learn. As Gopnick, Meltzoff, and Kuhl (1999) write, â€œOur view is that children’s whole conception of people, objects, and words changes radically in the first three years of life. And it changes because of what children find out about the worldâ€ (149). The authors describe other views (they note that changing behavior â€œmis tjust involve a genetic blueprint that unfolds on a particular maturation timetableâ€ (148), they do not spend much time on genetic-environmental interaction or alternative ethological theories. Below, I will outline an alternative theory of long childhoods, and alternative to their Western-centric approach, and lastly an alternative explanation of fascination with science. The authors note that the human childhood is unusually long: â€œWe have the most immature and dependent offspringâ€ (158). Well, perhaps, but what is said next is clearly not true: â€œNo creature spends more time dependent on others for its very existence than a human baby, and no creature takes on the burden of that dependence so long and so readily as a human adult.â€ There any in fact any number of co-dependent groups in the world: for instance, the eusocial insects (Wilson & Holldobler, 2005). Indeed, depending on others for existence is the very essense of the war-instinct, which we share with wolves, dogs, and chimpanzees (Wrangham, 1999). Co-dependence in these creatures is not for learning, but for better social functioning. One can easily imagine children as a form of Wilson & Holldobler’s â€œanatomically distinct worker casteâ€ — creatures who can work for the hive (their parents) but are unlikely to compete with their parents for mating resources. Perhaps the reason that human beings are for many years able to work but unable to reproduce is the same reason that many bees and ants are able to work but unable to reproduce: for those creatures in those years, they are adapted to be groupish. 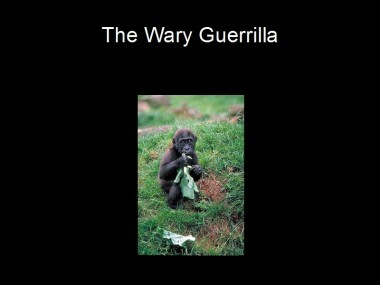 Another concern is the authors apparently Western-centric perspective. On the same page as the above questionable comments, the authors write â€œDuring our immaturity, we don’t have to commit ourselves to act in any particular way in order to survive.â€ Perhaps this is true of America, but do the authors believe this is true in much of Africa? Are the authors arguing that there is no significant correlation between child temperament and child mortality in much of the third world? Along with this, it is interesting to wonder if perhaps children in different parts of the world had to commit themselves to different acts in order to survive. Among the three populations of Africans, East Asians, and Europeans, for instance, different sets of genes had been favored by natural selectionâ€ (Wade, 2006). Could there be behavioral differences in infancy resulting from this? A way to excuse the above oversign would be to think the authors only meant that some childred do not mean to worry about behavior. Here, of course, they are right. Worldwide, whites in general are somewhat better off â€“ thus it may be misplaced to expect the book’s (white) authors to particularly care about children who look different from theirs. Additionally, some children simply don’t act differently depending on events. Certain children are genitically predisposed to be more sensitive to tragic events (Caspi et all 389, 2003), meaning that perhaps only certain children are designed to pay attention. Lastly, the authors appear to be confused about the nature of science. In attempting to explain an early, universal presence of a scientific mindset, the Gopnik, Meltzoff, & Kuhl write, â€œOur pleasure in reading popular science is a kind of vicarious pleasure in seeing how problems can be solved and oddities can be explained.â€ I hope the authors do not believe that the process of solving and explaining problems is the same thing as science! Just-so stories and pseudoscience fill the same roles (Russo, 2004). Indeed, it seems likely that only an infentesimile percentage of methods that gave us an â€œAha!â€ moments were generated by anything like the scientific method (Jung-Beeman, et al., 2004). So why pretnd that insights come mostly from science? Pseudoscience and other bunk are all too common among humans (Sagan, 1996), and that such things could be so overwhelming and science so rare may imply that science is only tangential to the way we are built to learn things.